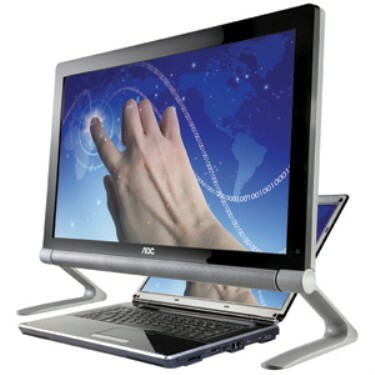 Fremont, Calif. – June 23, 2011 – AOC, the world’s largest manufacturer of LCD/LED Monitors and HDTVs, announces the launch of the Touch Monitor (e2239FwT), a Full High Definition LED monitor that adds multi-touch functionality to desktop computers and notebooks, and puts control at your fingertips. The sleek Touch Monitor features a unique dual-stand design with metal die-casting feet, a piano black bezel and a white high gloss back. The 22-inch widescreen monitor is ideal for PC users who want to add multi-touch input, particularly notebook computer owners who want a larger screen for entertainment and work purposes. The AOC Touch Monitor is now available for $299 at national retailers including TigerDirect, CompUSA, Amazon.com, among others. The AOC Touch Monitor features a glare-minimizing panel with 16:9 widescreen Full HD 1920 x 1080 resolution, 10,000,000:1 Dynamic Contrast Ratio, and a 5ms response time. The monitor presents high definition content at its native resolution while higher DPI boosts image sharpness of even the finest details, allowing users to view Full Screen HD Video without distortion or black bars. In addition to impressive image quality, the monitor also provides enhanced sound through its built-in SRS speaker bar. The Touch Monitor’s unique space-saving design – with two legs rather than a central stand– allows users to place a keyboard or other desktop items beneath the monitor. Users can also open a laptop, slide the screen underneath the monitor and simply connect the display via D-sub, USB or HDMI cable. Illuminated, soft-touch controls add to the monitor’s elegant and modern design, while colorful onscreen menu icons make it easier to adjust settings. The Touch Monitor features two side-mounted HDMI ports for connecting digital audio-visual devices and two USB 2.0 ports for easy connection to a PC. The Mercury (Hg)-free LED backlight panel lowers power consumption by up to 50 percent, consuming 0.1W in standby mode and less than 25W in normal mode. Additionally, the Touch Monitor includes a useful Power Off Timer that allows users to schedule an automatic turn off of the monitor. Multiple Touch Monitors can be easily Daisy Chained together for financial displays or educational purposes. No additional hardware or new VGA card is required to add the multiple displays, and even a notebook can add up to six additional screens. AOC is doing great thing, they have created their own new market.